Dr. Frank Gerold is a Valley Care Clinics orthopedic surgeon specializing in hand and upper extremity surgery. He practices in McAllen, as well as the surrounding cities in the Rio Grande Valley. A native Texan, Gerold grew up in Houston, where he pursued his education at the University of Texas Medical School Houston. After training in orthopedic surgery in New York at St. Luke’s Roosevelt Hospital, he attended a hand and upper extremity fellowship in Chicago at Loyola University Medical Center. Gerold is now an accomplished surgeon with a wide array of specialties concerning the hand and upper extremities. Our staff had the privilege of meeting with Gerold to get a closer look at what it means to be an orthopedic surgeon and the impact he is making on the lives of Valley residents. RGVision: How did you get into orthopedic surgery? Dr. Frank Gerold: One of the reasons why I went into orthopedic surgery is you can make an immediate, positive effect on a patient. We’re taking a patient who has a broken leg or a broken wrist and we’re stabilizing it and allow them to get out of bed and to do early range of motion and to really just get back to themselves as quickly as possible. One thing about hand surgery in particular that I love is the anatomy. I think it’s beautiful. You take something that is very complex and something that is very debilitating to a patient and you correct that — basically seeing instant results. R: What is your approach to patient care? Dr. FG: I treat each patient as an individual. Each injury I take care of certainly requires special attention to the details. So, I examine the patient and I take into account any medical problems and I create a specialized plan that is tailored to each problem. R: What is trending right now in orthopedic surgery? Dr. FG: There are a lot of things trending right now in orthopedic surgery. In the joint arthroplasty world, there’s a lot of robotic surgery. In general, there is a trend towards biologics and different bone grafts that can help heal fractures quicker than they would without out it. Tailored towards what I do, hand and upper extremity surgery, a current trend is the newer techniques like minimally invasive approaches. R: How do you stay up to date with advanced and current trends? Dr. FG: That’s a great question. There are many ways to stay up to date. I read the literature, I subscribe to journals, I go to courses. In fact, yesterday I went to a cadaver lab where I trained on a new technique: capitate resurfacing. R: Tell us about capitate resurfacing. Dr. FG: Capitate resurfacing is a procedure for patients with wrist arthritis or primary wrist arthritis, or patients who have had failed previous surgeries to take care of arthritis. It’s a procedure that takes the capitate bone and recontours the joint surface so that it can move freely with less pain. You could consider it a limited joint replacement, or an arthroplasty. R: Tell us about some of the unique procedures you specialize in, as well as some of the more common ones. Dr. FG: I’m a hand and upper extremities specialist. And that really involves taking care of anything from the shoulder to the fingertip. Where I trained, we took care of a lot of complex problems. We’re talking about bone fractures, injuries to nerves, injuries to arteries — even simple sports injuries — sprains, strains. For example, [treating] a rotator cuff injury (… a very common injury) versus someone who cuts one of the major nerves that controls the function of their hand, and doing the various reconstructive procedures to take care of that patient. R: How do patients find you? 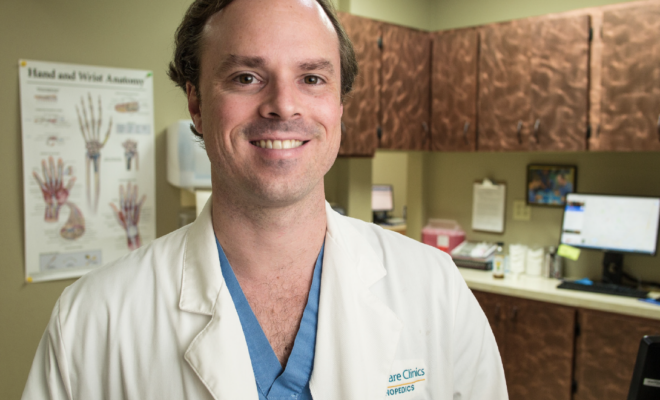 Dr. FG: As an orthopedic surgeon I certainly have office hours, and I take care of patients who are referred to my office. But when a patient comes in with a certain injury that requires a sub specialist, say they get into a car accident and they are brought to the emergency room, I’ll get a phone call from the emergency room and I can go in and take care of the patient. R: Do you have any memorable patients or experiences? Dr. FG: I remember taking care of a patient last year who had multiple injuries and over the past year I have gotten to know both her and her family. I’ve seen them for multiple issues and every time she comes to the office it’s hugs, it’s pictures, and they’re so happy with the care that they got … getting her back to her normal self. I get a great amount of satisfaction from those encounters. R: What would you like people to know about hand and upper extremity surgery? Dr. FG: One thing that becomes very apparent when you injure your hand or your extremity, is how important it is having boths hands fully functional. When you have one hand or an arm taken out of the equation and you can’t use it because it’s fractured or severely injured, it really changes your life. Getting those patients fixed, rehabbed, and on the road to recovery is of utmost importance. R: What do you enjoy most about your profession? Dr. FG: I just love what I do. I love orthopedic surgery. I love taking care of sick patients and helping them through from injury to recovery. To learn more about what Dr. Frank Gerold can do for you, call his office at (956) 586-0333.